You have nothing to lose – ever! I recently saw someone wearing a T-shirt with a line that read: “When will we ever have nothing to lose?”The import of that line appeared to be that there’s so much at stake, most of the time for everyone, that there won’t ever be a time when someone will ever have nothing to lose! I have a different perspective to offer. From the time we are born to the time we will die, none of us has anything to lose. Or, simply, all of us have nothing to lose, in any case! Because you came with nothing and you will go with nothing. Whatever you have got has been given here – in this lifetime. So, even if whatever you have got now – your assets, cash, family, lover, your reputation, whatever – is taken away from you, you don’t have to sweat over it. Because you will never be able to take them away with you when you die! So, my answer to the question on the T-shirt is: You have nothing to lose – ever! The Japanese martial art form of Karate, now also a major sport, has a deep, spiritual relevance to what we are discussing. 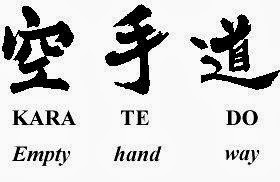 The word Karate comes from a root that really means empty-hand. Gichin Funakoshi, founder of the Shotokan style of Karate, is widely credited with introducing and popularizing the discipline on the islands of Japan. Funakoshi changed the way the art form was called, from Karate-jutsuto Karate-do with the do suffix implying that it is a path to self-knowledge and not just a study of a technique of fighting. Karate soon came to mean “the way of the empty hand”. In Karate-Do Kyohan, Funakoshi quoted from the Heart Sutra, which is prominent in Shinghon Buddhism: “Form is emptiness. Emptiness is form itself.” Funakoshi interpreted the kara of Karate-do to mean: “To purge, empty, oneself of evil and selfish thoughts”. He championed that if a Karate practitioner could understand that “empty-handed I come, empty-handed I will go and empty-handed I am here – ready for combat”, then the practitioner has nothing to lose! Funakoshi says one can become a great warrior with this understanding. Then no one can defeat such a warrior, no one can rob him or her – because he or she is empty and has nothing to lose! When you have nothing to lose, it logically means that you really have everything to gain. The essence of intelligent living is to understand, to appreciate and to live by the thinking that there’s really “nothing to lose” in Life! When you are willing to live fully, with no fear of losing anything – because there is nothing to lose really – then all you will do is to gain, to attain – happiness, inner peace, fulfilment and bliss! Author AVIS ViswanathanPosted on November 20, 2013 March 14, 2016 Categories Art of Living, Bliss, Fulfilment, Gichin Funakoshi, Happiness, Inner Peace, Intelligent Living, Karate, Karate-Do, Karate-Do Kyohan1 Comment on You have nothing to lose – ever!